In the dot operator method, you must know what field to access at compile time. In contrast, the index operator method basically shuts down all error checking on the compiler and lets you index any object with any expression: a literal, a variable, or the result of a computation. With that in mind, I’ve updated the performance-testing app from Dynamic Field Access to include index operator reads and writes and do more tests per loop to lessen the impact of loop overhead. Performance results and graphs follow this test code. 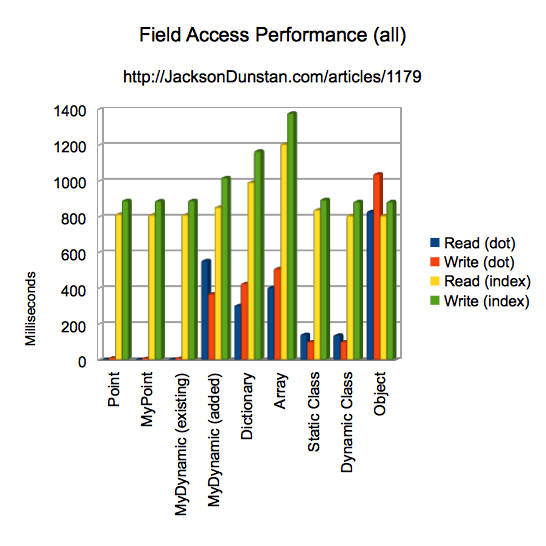 Here we see that accessing static fields is tons faster than accessing dynamic fields. Keep in mind that the “slow” accesses here are already hugely faster than the same classes (except Object) when accessed with the index operator. All this means is that static field access is comparatively very fast. What’s striking about this graph is how most of the various performance differences between the different object types have disappeared. 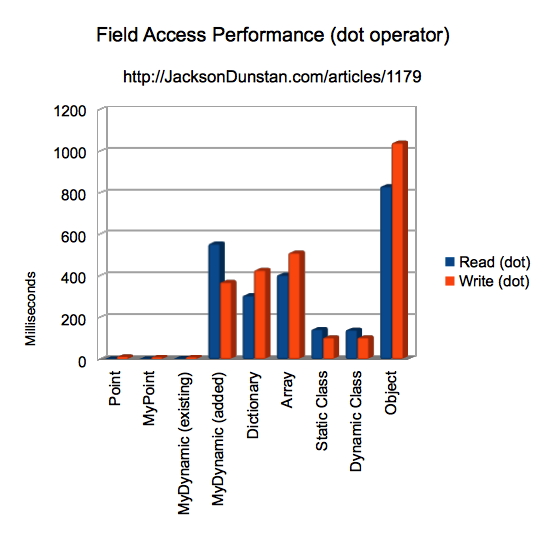 Dynamic class fields, Dictionary, and Array are slower than everything else. Strangely, this even includes Object, which seems remarkably indifferent to access methods. As for reading versus writing fields, we see two completely different pictures depending on access method. Writing is always about 10% slower than reading when using the index operator. On the other hand, the dot operator yields inconsistent results. The dynamic Object, Dictionary, and Array classes are consistent with the dynamic index operator in being slower to write. This is even the case for the static fields, except with dynamic class instances and Class objects. Still, the difference seems to be plus or minus 20% at most in all cases. In sum, do not use the index operator to access fields in performance critical code. An exception would be when dealing with plain Object variables, but these are so slow that you’d best avoid them in the first place. It would be interesting to compare declared fields in a dynamic class vs non declared fields in a dynamic class. Also interesting would be sequential array indexes vs sparse array indexes. The MyDynamic tests are for declared fields (“existing”) and non-declared fields (“added”). I declared an x field and added a z field. As for Array‘s sparse and dense portions, I’ve covered that before as well as some more advanced topics like what it takes to join the dense and sparse portions, etc. 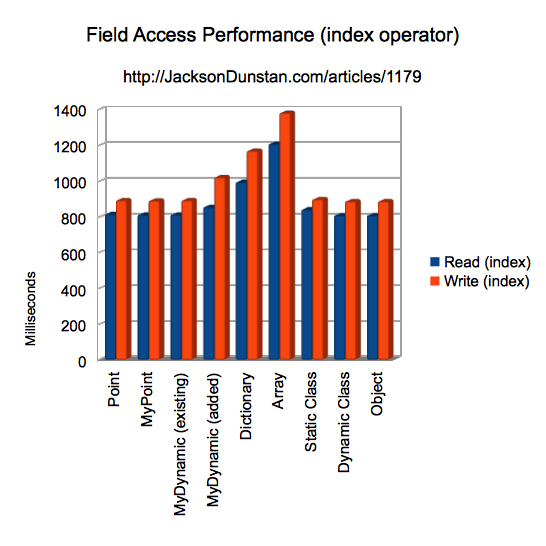 In short, dense reads are about 3x faster than sparse ones. It’s curious that added fields of a dynamic class are faster than Object. If you have to use the index operator, yes, but if you have the choice of using the dot operator, Dictionary is way faster. Check out the second graph for a comparison. Good to know! How do you access an array using the dot syntax? Nevermind I just saw your code. I didn’t know we could do it. You can use dot syntax for Array instances, but then you’re not really using it as an array — you’re just using it as a dynamic class that happens to be built-in instead of one that you created yourself. Any dynamic properties you use on an Array (such as “x”) don’t count as elements in the array — they don’t change it’s length property, you can’t access them with pop()/shift(), etc. In other words, there’s nothing array specific about using an Array in this way; (putting aside performance differences) it’s really just a coincidence that you’re using an Array instead of an Object or MyDynamic. Most importantly, you can’t use dot syntax for the elements of an array (the numeric-indexed properties) because the syntax isn’t valid–that’s why you have to use myArray (or myArray[“0”]) instead of “myArray.0”.